India, January 11th, 2018: Let’s celebrate life and fitness. Gold’s Gym one of the leading fitness chains globally started the new year with a bang -- 12 eminent personalities and 12 inspirational stories , all rolled into one big aspiration called the Gold's Gym Calendar 2018. The fitness brand has chosen eminent and multi personalities from different walks of life who have shaped lives and have made enormous contributions to the nation. While the overall theme of the Gold's Gym Calendar is fitness, these personalities have been positioned as “Achievers of the year” from their respective fraternity simply because they have done justice to their work and at the same time they wear fitness on their sleeves on a day to day basis. 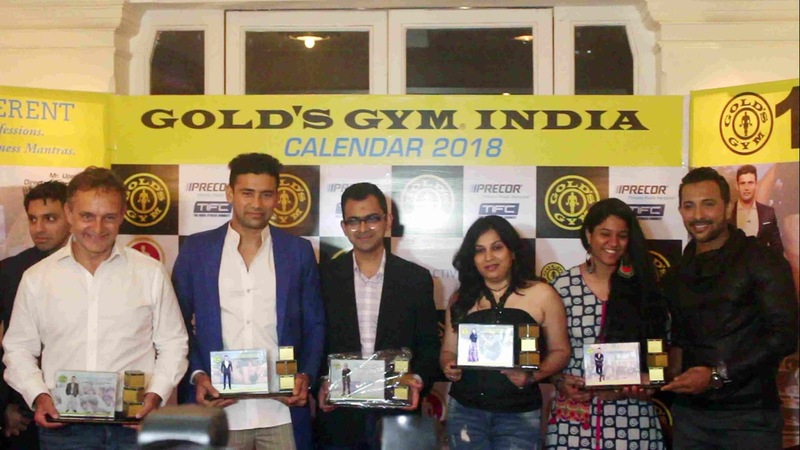 The launch of the Gold's Gym Calendar 2018 took place at Tote on the Turf, Mahalaxmi, Mumbai at the hands of the very 12 celebs who are featured in the Calendar over a wine and cheese session that was attended by the who's who. Gold’s Gym has been introducing annual calendars since a decade for its premium members, vendor partners, associate brand partners, etc. The brand has successfully completed 15 years of unrivalled success in providing the finest equipment and fitness knowledge available to its members to achieve their individual potential. Gold’s Gym India has been shaping lives in India since the past 15 years with 125+ clubs across 85+ cities in India. The brand believes in shaping bodies as well as lives. With the efforts of Mr.Jagdish Valecha – Chairman and three dynamic Directors – Mr. Rajesh Advani, Mr. G. Ramchandran and Mr. Karan Valecha Gold’s Gym has achieved multiple awards for excellence under its belt and has expanded its fitness profile to give best customer experience with excellent mix of equipment, well qualified trainers who undergo continuous knowledge upgrade with in house fitness institute, we have and will always endeavour to help our customers to achieve their fitness goals.